An Aircraft Technician is accountable for day-to-day aircraft maintenance activities. The common duties listed in the Aircraft Technician Resume include some or all of the following – verifying aircraft conformity, checking the status of engine and cockpit pieces, maintaining aircraft efficiency, repairing defects, ensuring smooth functioning of all aircraft parts, performing routine checkup of all parts, diagnosing problems and resolving problems confidently. Technical knowledge and experience are required for this position, the most sought-after skills expected from qualified aircraft technician include – attention to details, dexterity, technical skills and troubleshooting skills. The aircraft technicians should have a thorough knowledge of aircraft maintenance and able to read well gauges and assess the exact repairing needed. These technicians should also have the agility to climb and work on aircrafts using balance without fear. Aircraft technicians should have learned their skills from approved FAA aviation maintenance schools and also hold a degree in aviation maintenance management. Summary : Highly-skilled Aircraft Mechanic with 10 years of experience is seeking a position that can offer opportunities for long-term professional and personal growth. Skills : Beechcraft, King Air Series, Great With Time Management Cessna Citation 500 Series Airframe, And Powerplant, Able To Learn Quickly, Fluent In Spanish, Industrial Equipment Operation Experience, And Federal Aviation Administration (FAA) Regulations. Maintain, repair, and modify aircraft systems and structures as well as structural and system components of moderate difficulty, modify flight controls, engines, hydraulics, pneumatics, fuel systems, and mechanical. Assist in developing specialized fixtures, test equipment and procedures for failure analysis. Calibrate/adjust equipment to ensure quality production utilizing calipers, micrometers, and protractors. Monitor gauges, dials and various indicators to ensure aircraft are operating correctly. Performed complex mechanical alignments and calibration of equipment to quality standards. Operated a wide variety of hand and power tools including hoists, drills, hydraulic mule, precision measuring. Followed company procedures to maintain the work environment in a neat and orderly condition. Inspected machine parts for conformance and quality to product/customer specifications. Interpreted schematic blueprints, wiring diagrams, performance specifications and service manuals. Performed N. D. T. Inspection per A.C. 65-31a including fluorescent penetrant, eddy current, and Magnaflux. 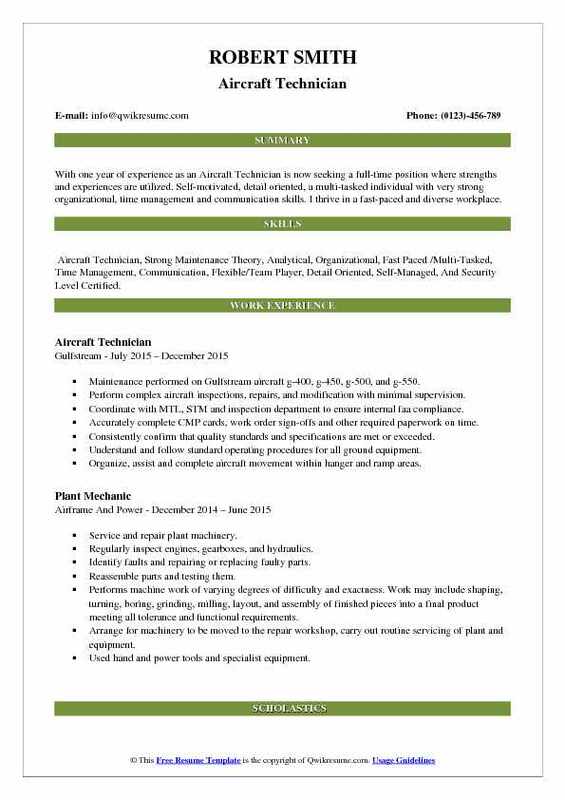 Objective : Service-oriented Aircraft Technician with 2 years background at airlines. Core competencies include determination, focused and protecting companies interest, and as well as excellent communication and time-management skills. Handles tasks with accuracy and efficiency. Skills : English Language, Writing, Active Listening, Time Management, Mechanical, Active Learning, And Foreign Language (Arabic, Write, Read And Speak). Performing day to day planned and unplanned aircraft line maintenance on A320, A319, B787, B777. B747, B737, MD11 EMB-170 and EMB-175 maintain line maintenance related tooling, stands, and ground equipment. Reading and interpreting maintenance manuals, service bulletins, and other specifications to determine the feasibility and method of repairing or replacing malfunctioning or damaged components. Inspecting completed work to certify that maintenance meets standards and that aircraft are ready for operation. Maintaining repair logs, documenting all preventive and corrective aircraft maintenance. Conducting routine and special inspections as required by regulations. Checking for corrosion distortion, and invisible cracks in the fuselage, wings, and tail, using x-ray and magnetic inspection equipment. 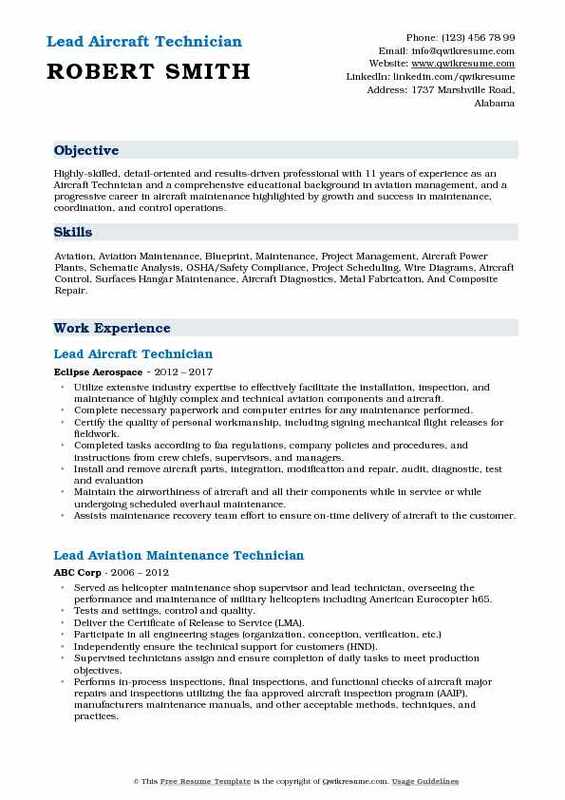 Objective : With one year of experience as an Aircraft Technician is now seeking a full-time position where strengths and experiences are utilized. Self-motivated, detail oriented, a multi-tasked individual with very strong organizational, time management and communication skills. I thrive in a fast-paced and diverse workplace. 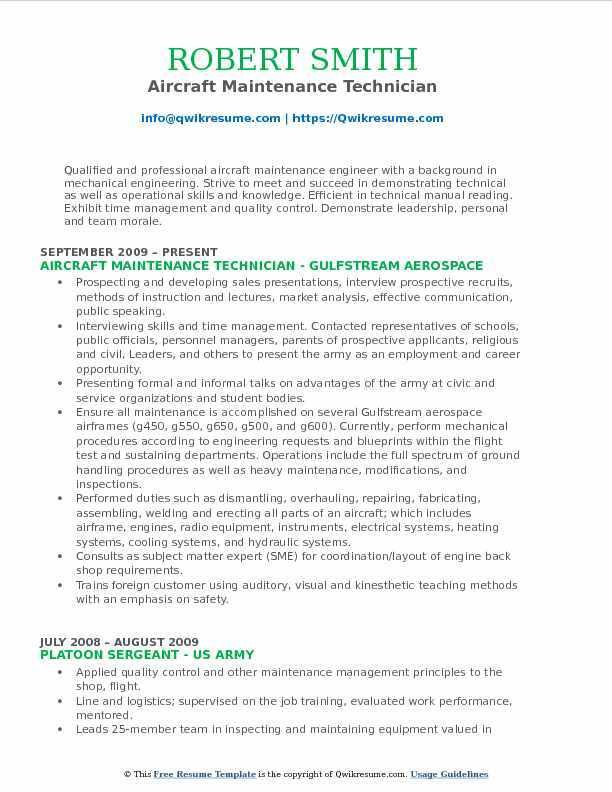 Skills : Aircraft Technician, Strong Maintenance Theory, Analytical, Organizational, Fast Paced /Multi-Tasked, Time Management, Communication, Flexible/Team Player, Detail Oriented, Self-Managed, And Security Level Certified. Maintenance performed on Gulfstream aircraft g-400, g-450, g-500, and g-550. Perform complex aircraft inspections, repairs, and modification with minimal supervision. Coordinate with MTL, STM and inspection department to ensure internal faa compliance. Accurately complete CMP cards, work order sign-offs and other required paperwork on time. Consistently confirm that quality standards and specifications are met or exceeded. Understand and follow standard operating procedures for all ground equipment. Organize, assist and complete aircraft movement within hanger and ramp areas. Perform all duties with little to no supervision with a positive attitude. 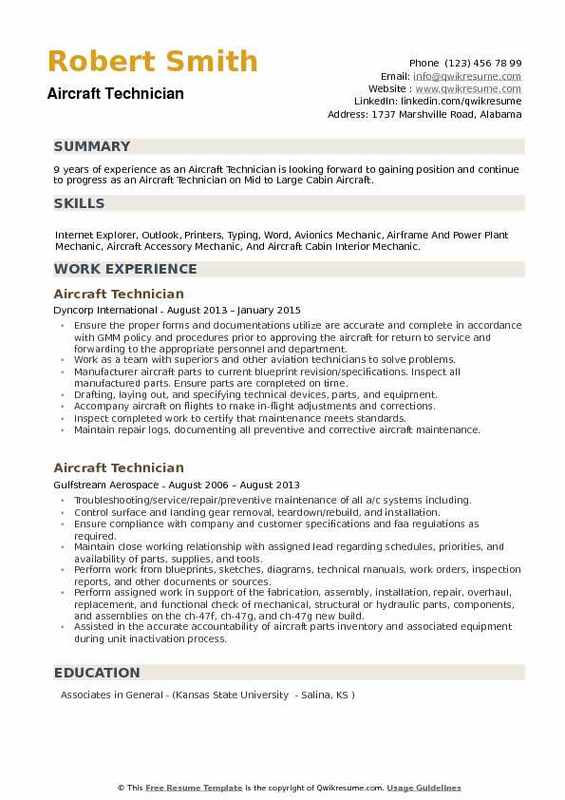 Summary : 17+ years of extensive experience as an Aircraft Technician. Transition into a customer focused role and be a leader within the aviation sector allowing me to draw from my professional experiences and personality to serve my team, customers, and company in order to maximize individual talents and drive positive results. Skills : Microsoft Office Suite, Osha, Aircraft Systems, Logistics, Logistics Support, Maintenance, Quality Assurance, Aircraft Systems Installation, Integration, Proof Pressure And Test. Maintaining falcon 7x, falcon 900ex easy and Sikorsky s76 aircraft in accordance with all federal aviation regulations, aircraft manufacturers requirements and company policies. Preparing, review and maintain aircraft maintenance records and long-term documentation to include paper and electronic formats. Responsible for camp inventory management system and parts databases with a value over $1m dollars to include RO tables, calibrated tooling, and consumables. Project management oversight of major aircraft maintenance events, including budgetary concerns, personnel and time management. Collaborating with maintenance leadership and flight department leadership to forecast and plan f7x and f900 aircraft expenses based on projected asset utilization and life cycle phases. Leading an inventory initiative to implement cost-saving methods and improve operational and capital efficiency that resulted in savings of over $45k in fy2013, and $35k in fy2015. Leading peers to excellence with integrity, character, and professionalism. This includes serving the team through cross-functional collaboration as a member of the Eos team, in an effort to better serve our customers. 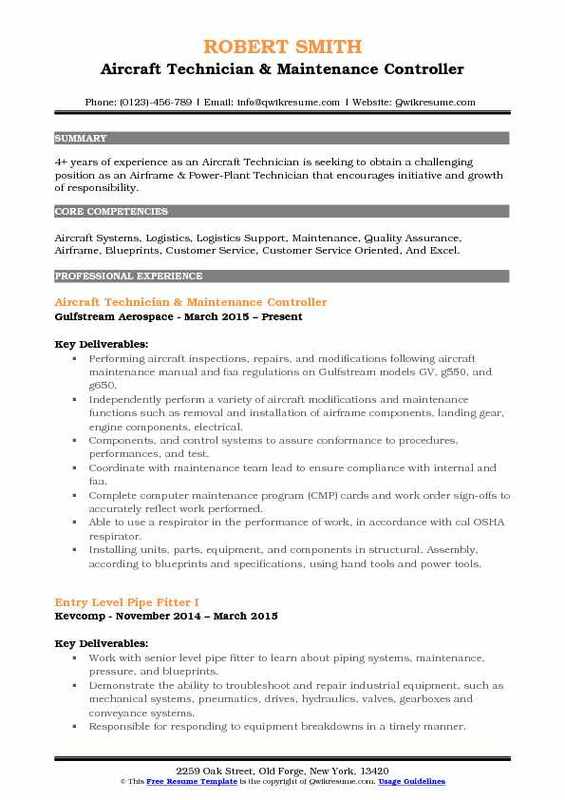 Headline : Service-oriented Aircraft Technician with 5+ years background in aviation. Core competencies include troubleshooting and repairing, as well as excellent communication and time management skills. Handles tasks with accuracy and efficiency. Skills : Mechanical Repairing, Equipment Maintenance, Inventory Management, Quality Control Analysis, IT Management, Engineering, And Technology. Inspecting completed work to certify that maintenance meets standards and that aircraft. Read and interpret maintenance manuals, service bulletins, and other specifications to determine the feasibility and method of repairing or replacing malfunctioning or damaged. Conduct daily/overnight and weekly service checks of aircraft in line with maintenance schedule requirements. Summary : Highly-skilled, detail-oriented and results-driven professional with 11 years of experience as an Aircraft Technician and a comprehensive educational background in aviation management, and a progressive career in aircraft maintenance highlighted by growth and success in maintenance, coordination, and control operations. Skills : Aviation, Aviation Maintenance, Blueprint, Maintenance, Project Management, Aircraft Power Plants, Schematic Analysis, OSHA/Safety Compliance, Project Scheduling, Wire Diagrams, Aircraft Control, Surfaces Hangar Maintenance, Aircraft Diagnostics, Metal Fabrication, And Composite Repair. Utilize extensive industry expertise to effectively facilitate the installation, inspection, and maintenance of highly complex and technical aviation components and aircraft. Complete necessary paperwork and computer entries for any maintenance performed. Certify the quality of personal workmanship, including signing mechanical flight releases for fieldwork. Completed tasks according to faa regulations, company policies and procedures, and instructions from crew chiefs, supervisors, and managers. Maintain the airworthiness of aircraft and all their components while in service or while undergoing scheduled overhaul maintenance. Assists maintenance recovery team effort to ensure on-time delivery of aircraft to the customer. 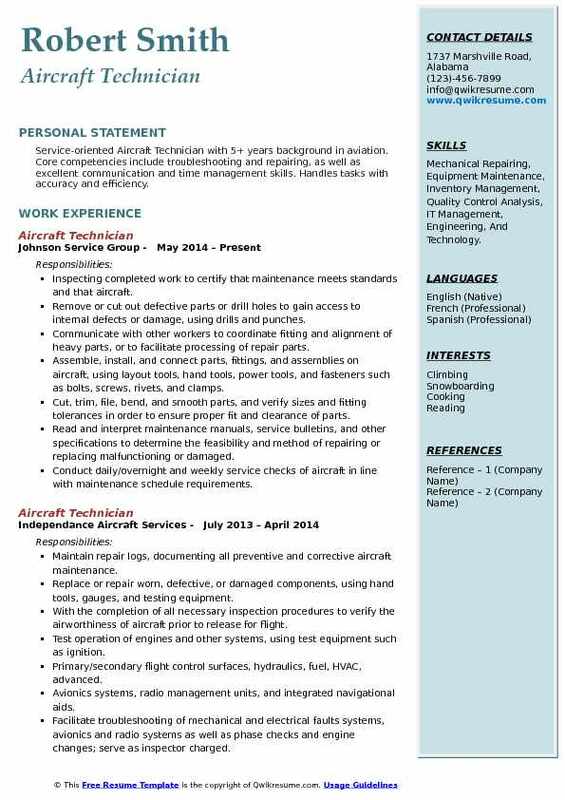 Summary : Qualified and professional aircraft maintenance engineer with a background in mechanical engineering. Strive to meet and succeed in demonstrating technical as well as operational skills and knowledge. Efficient in technical manual reading. Exhibit time management and quality control. Demonstrate leadership, personal and team morale. 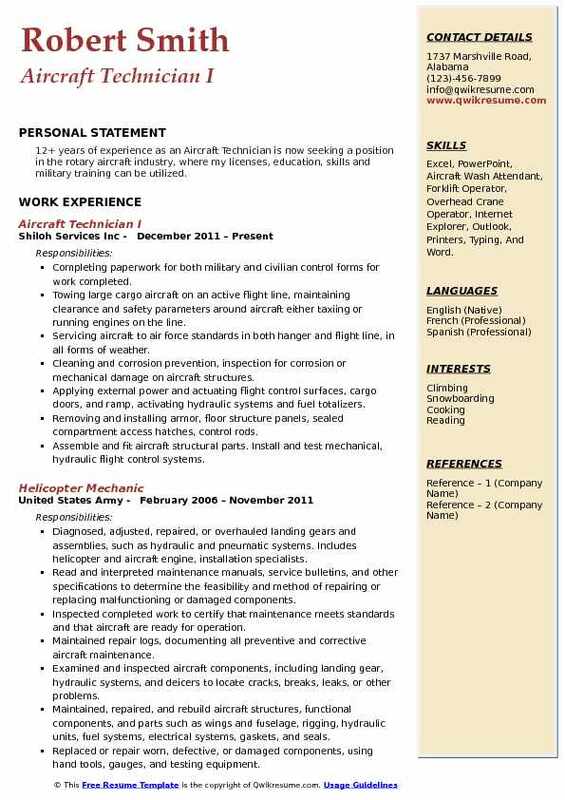 Skills : 30 WPM, Aviation, Instructor, Maintenance, Weapons, Aviation Maintenance For CH-47D Helicopters, OH-58 Helicopters, Aviation Forms And Records Management, Small Arms Weapons Instructor- M9, M16, M249, 50 Cal Submachine Gun, Aviation Battalion Master Gunner, Microsoft Office 2007, PowerPoint Type 30 WPM ,Knowledge Of The Army Maintenance Management System (TAMMS) And Applicable Army Publications. Prospecting and developing sales presentations, interview prospective recruits, methods of instruction and lectures, market analysis, effective communication, public speaking. Interviewing skills and time management. Contacted representatives of schools, public officials, personnel managers, parents of prospective applicants, religious and civil, Leaders, and others to present the army as an employment and career opportunity. Presenting formal and informal talks on advantages of the army at civic and service organizations and student bodies. Ensure all maintenance is accomplished on several Gulfstream aerospace airframes (g450, g550, g650, g500, and g600). Currently, perform mechanical procedures according to engineering requests and blueprints within the flight test and sustaining departments. Operations include the full spectrum of ground handling procedures as well as heavy maintenance, modifications, and inspections. Performed duties such as dismantling, overhauling, repairing, fabricating, assembling, welding and erecting all parts of an aircraft; which includes airframe, engines, radio equipment, instruments, electrical systems, heating systems, cooling systems, and hydraulic systems. Consults as subject matter expert (SME) for coordination/layout of engine back shop requirements. Trains foreign customer using auditory, visual and kinesthetic teaching methods with an emphasis on safety. Objective : 4+ years of experience as an Aircraft Technician is seeking to obtain a challenging position as an Airframe & Power-Plant Technician that encourages initiative and growth of responsibility. Skills : Aircraft Systems, Logistics, Logistics Support, Maintenance, Quality Assurance, Airframe, Blueprints, Customer Service, Customer Service Oriented, And Excel. Performing aircraft inspections, repairs, and modifications following aircraft maintenance manual and faa regulations on Gulfstream models GV, g550, and g650. Independently perform a variety of aircraft modifications and maintenance functions such as removal and installation of airframe components, landing gear, engine components, electrical. Components, and control systems to assure conformance to procedures, performances, and test. Coordinate with maintenance team lead to ensure compliance with internal and faa. Complete computer maintenance program (CMP) cards and work order sign-offs to accurately reflect work performed. Able to use a respirator in the performance of work, in accordance with cal OSHA respirator. Installing units, parts, equipment, and components in structural. Assembly, according to blueprints and specifications, using hand tools and power tools. 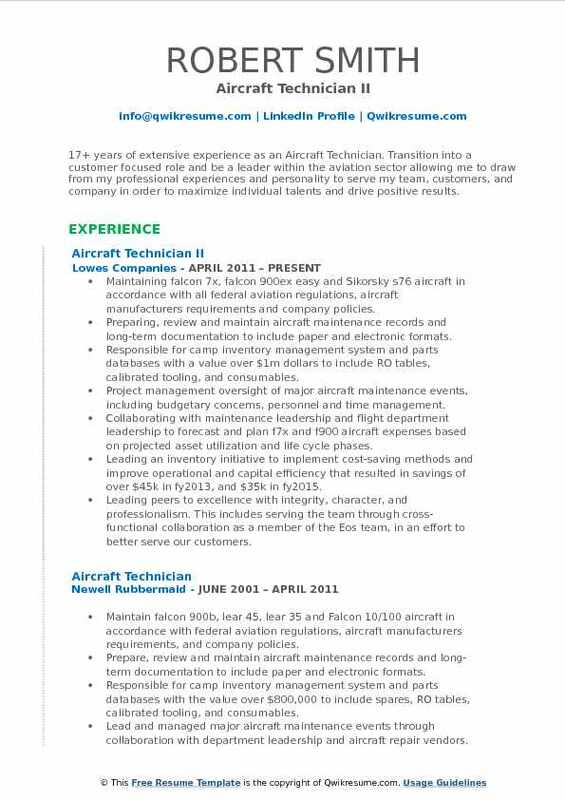 Summary : 12+ years of experience as an Aircraft Technician is now seeking a position in the rotary aircraft industry, where my licenses, education, skills and military training can be utilized. 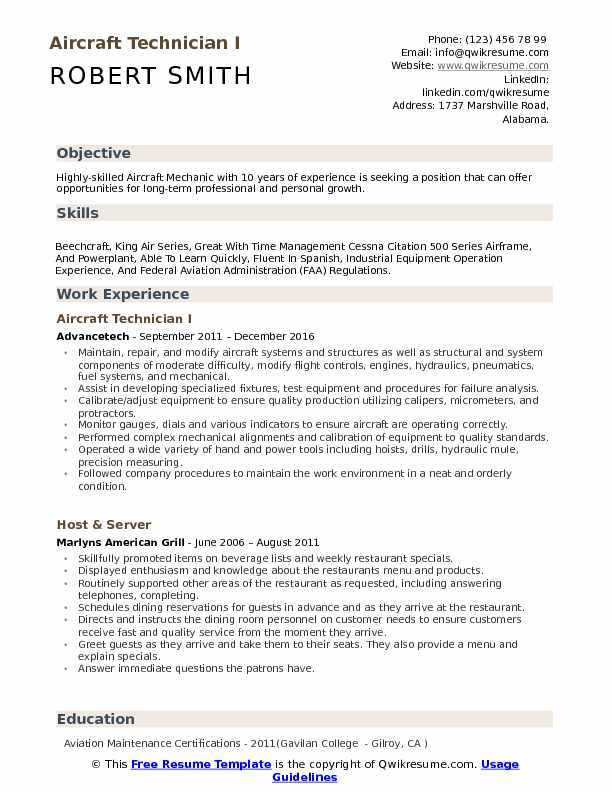 Skills : Excel, PowerPoint, Aircraft Wash Attendant, Forklift Operator, Overhead Crane Operator, Internet Explorer, Outlook, Printers, Typing, And Word. Completing paperwork for both military and civilian control forms for work completed. Towing large cargo aircraft on an active flight line, maintaining clearance and safety parameters around aircraft either taxiing or running engines on the line. Servicing aircraft to air force standards in both hanger and flight line, in all forms of weather. Cleaning and corrosion prevention, inspection for corrosion or mechanical damage on aircraft structures. Applying external power and actuating flight control surfaces, cargo doors, and ramp, activating hydraulic systems and fuel totalizers. Removing and installing armor, floor structure panels, sealed compartment access hatches, control rods. Assemble and fit aircraft structural parts. Install and test mechanical, hydraulic flight control systems. 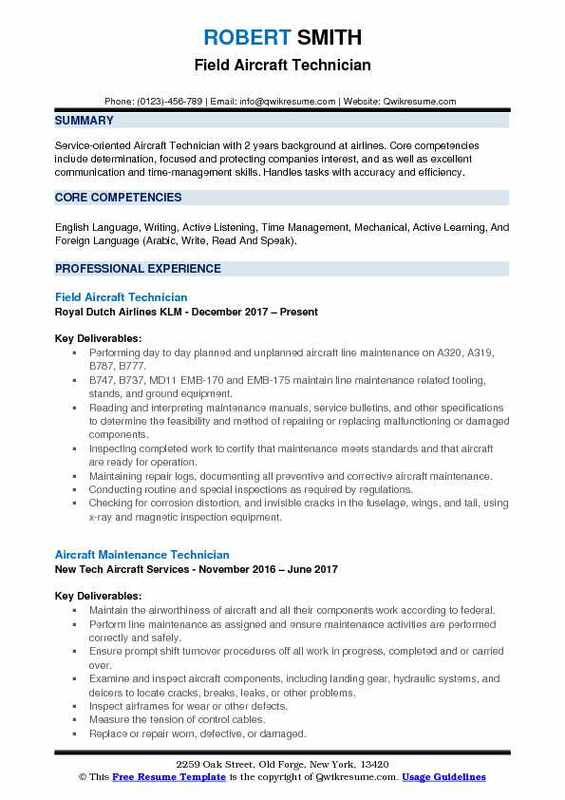 Summary : 9 years of experience as an Aircraft Technician is looking forward to gaining position and continue to progress as an Aircraft Technician on Mid to Large Cabin Aircraft. Skills : Internet Explorer, Outlook, Printers, Typing, Word, Avionics Mechanic, Airframe And Power Plant Mechanic, Aircraft Accessory Mechanic, And Aircraft Cabin Interior Mechanic. Ensure the proper forms and documentations utilize are accurate and complete in accordance with GMM policy and procedures prior to approving the aircraft for return to service and forwarding to the appropriate personnel and department. Work as a team with superiors and other aviation technicians to solve problems. Manufacturer aircraft parts to current blueprint revision/specifications. Inspect all manufactured parts. Ensure parts are completed on time. Drafting, laying out, and specifying technical devices, parts, and equipment. Inspect completed work to certify that maintenance meets standards.